As the former PM becomes an octogenarian, Editor-in-Chief Father Raymond de Souza notes his years leading Canada showed courage but his after-office shenanigans were unbearably shabby. Brian Mulroney turned 80 yesterday, a decade past his three-score-and-ten Biblical allotment. So, it is time for the draft obituaries to run. Our publisher Peter Stockland was out of the gate on Monday. Far be it from me to accuse one Irish Montrealer of being smitten by another Irish Montrealer, but our esteemed publisher appeared to get goosebumps over Mulroney’s performance for St. Patrick’s Day last week. In fairness, Mulroney has always been a great performer, ever since he sang Danny Boy for his father’s employers back in his Baie Comeau childhood. He has never stopped performing since. And with Mulroney there is no pretense. He does expect you to think him sincere. He does not expect it of himself. It is a great show, and he enjoys it as much as his audience does. No Irish Montrealer was ever more thoroughly seduced by another Irish Montrealer than Brian Mulroney seducing himself. Of course, you were not to believe that, or even to think that Mulroney himself believed that. But the man in the dock faced a dramatic moment and was in need of a fitting flourish to conclude his testimony. Perhaps a bit of impossibly vain hyperbole would do the trick? Why not? The audience may enjoy it. Even they didn’t, Mulroney himself would. Anne Kingston of Maclean’s had her pre-obituary in last month, putting Mulroney on the well-worn path of the unpopular pol who left office much hated, but is now an esteemed elder statesman basking in the kind glow of a more favourable accounting from history. Aside from Hitler and Stalin, there is no former leader, should he live long enough, who does not get this treatment. Kingston noted that his “stirring eulogy for another U.S. president, George H.W. Bush, won plaudits and made Canadians proud.” Perhaps. It certainly made Mulroney proud. He needs long years to put distance between himself and his post-premiership, which instead of enduring political sacrifice for a principled vision, sacrificed principle for personal gain. After he got through the usual not-to-be-taken-seriously hyperbole about Americans being God’s almost-chosen people, and George Bush the Elder being more principled than, say, Abraham Lincoln, Mulroney got down to serious business: Mulroney. Of course, Mulroney got it just right. Bush thought so. And if you need confirmation, just ask Mulroney himself. Our man Peter, made of sterner stuff than the weepy former president, did not shed tears last week. 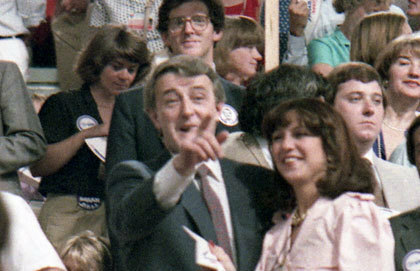 He remained clear-sighted and his principal point is correct, namely that Mulroney’s premiership – contrary to his public performances of schmaltz and sycophancy and sentiment and occasional sleaze – was full of substantive policy reforms undertaken with great political courage. Mulroney took on three major economic initiatives because he thought they were right for Canada: free trade with the United States, tax reform including the GST, and the anti-inflation policy of the Bank of Canada in the early 1990s. Free trade was a battle, and the other two were massively unpopular. On the constitutional file, the initial popularity of the Meech Lake Accord became a multi-year train wreck that he nevertheless saw through to the end with great persistence. Mulroney was never in the league of his contemporaries Ronald Reagan or Margaret Thatcher as a political leader of unshakable convictions, but his premiership was one of great ventures on major files, in which he was willing to suffer sustained unpopularity in order to advance an agenda he thought right for Canada. Mulroney at 80 does not then need the vindication of history for his premiership. He needs long years to put distance between himself and his post-premiership, which instead of enduring political sacrifice for a principled vision, sacrificed principle for personal gain. His first major project after leaving 24 Sussex was a trip to China, while still an MP, to do some lobbying for various corporate clients. Indeed, he remarked at the Oliphant inquiry that he was well-received by the Chinese leadership because he took a more conciliatory approach with them after the 1989 massacre in Tiananmen Square. Later, Mulroney would travel to Saudi Arabia for the same purpose and return to sing the kingdom’s praises in The Globe and Mail. The former prime minister was not an elder statesman, but a shill for hire. Mulroney would point out that the Oliphant inquiry cleared him of illegality. But it made abundantly clear that there was something shabby about it all. At 80, it appears that the mercenary drive has diminished, and apologetics for odious regimes can be left to a new generation. The Clintons are only in their early 70s. Happy birthday, Brian Mulroney. You did not deserve the criticism you received when prime minister. You only earned that afterward. Convivium means living together. We welcome your voice to the conversation. Do you know someone who would enjoy this article? Send it to them now. Do you have a response to something we've published? Let us know!